Mike DiGiovanni, emerging technology leader at Isobar, and author of the Winky app, wearing his Google Glass as part of the Explorer project. 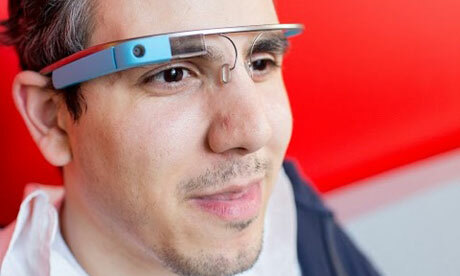 How long have you been using Google Glass, and what are your first impressions? DiGiovanni: Two weeks ago I got to pick them up – and I've been using them non-stop. It takes a while to get used to them. But I've been wearing them while driving, walking, essentially all the time. It's quite similar to wearing glasses – I don't normally – but without something sitting in front of your eyeballs. The display is just outside your normal range of vision, so that you have to roll your eyes upwards – it sits on the top right. I turned it on by nods. You can still wear them while driving and know that you are not going to be interrupted by something popping up in your view. The software experience is primarily voice activated. You say "OK Glass" and then "take a picture", or "Google something" or "give me directions to somewhere". You can ask it maths questions, you know like "what is two plus two" as you can in Google, as well. As you take pictures, and emails and text messages come in, they go into your timeline which is shown in the display. If you're driving or going somewhere, you get a Google Map with directions. It's much better than having a sat nav – much less distracting, because you're not really taking your attention down off the road – you still have your head up, though you do look up to the right.